Eiji Nonaka's hit gag manga Sakigake! Cromartie High School was one of those hard-to-miss titles that was so contrary to the mainstream that its eventual animated form felt so crisp and funny to watch. While it didn't depend on animated movement as much as it did on still-life, the final product was confident, each episode containing a mix of shorter stories with obscure situational comedy. I'm assuming that Nonaka felt the short bursts of comedy were its selling points, as he's tried to duplicate the comedy in Double-J, a collaborative effort with fellow artist Maru Asakura. The effort itself isn't without a decent gag concept. Nagashima High School (another school named after a baseball player!) has a unique after-school activity run by its students called the "Cultural Activity Preservation Club". When Hajime and her friend Sayo look to join it, they find that many of the activities are trivial in nature; after all, what's so impressive about carving the tops of toothpicks and redesigning 7th-century "manga"? While Nonaka's switch from a rough yankii story to fluffier moe nonsense is impressive, there seems to be weaknesses that drag the animation down. 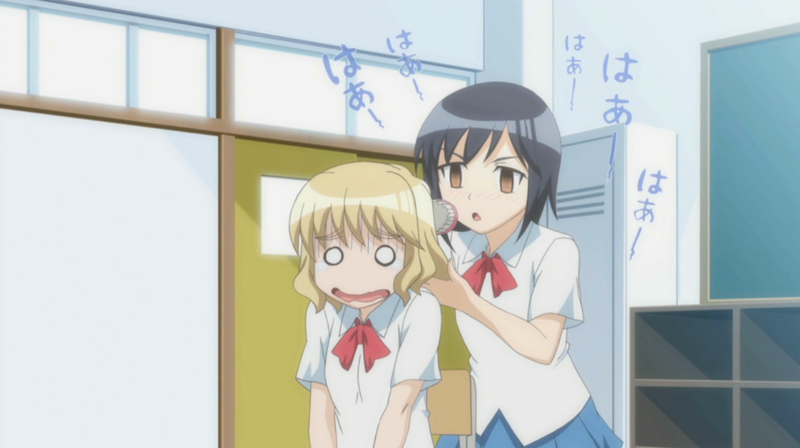 While there were playful transitions for the animation in Cromartie High School, such devices are missing in Double-J, even though the story seems to be told in the same manner. The humor takes a moment to sink in, but the snapback responses aren't as emotionally sharp as the ones you would see in other manzai-styled shows such as Nichijô or Arakawa Under The Bridge. For now, Double-J can only be seen within the Yuruani? animation block on NTV with three other mini-shows. Perhaps its lack of an edge makes it easier to watch in five-minute spurts—if Double-J was a twenty-minute show, it would be as dull as licking envelopes, but at the current length (and apparent budget), it could be decent. 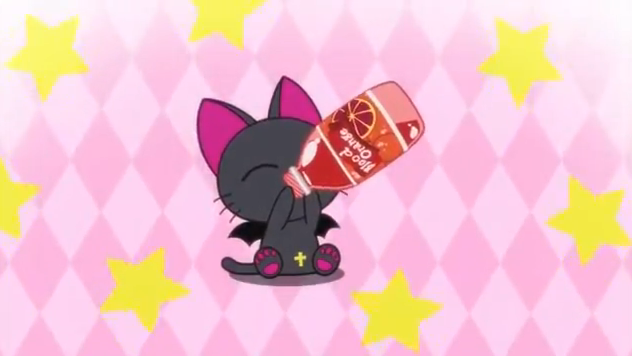 Hello Kitty has been an offensive juggernaut that no other assembly of two-dimensional mascots can forcibly take down. 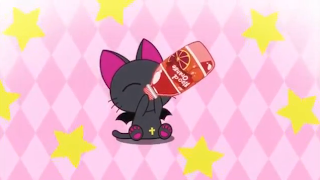 Yeah, Pikachu, Anpan-man, and Doraemon can take Sanrio by the horns and deliver a marketing body-slam, but when it comes to paper-thin moppets, Kitty-chan is #1. Somehow, Nyanpire the Animation thinks it can borrow from the Sanrio monopoly, darken the mood a little bit, and deliver a solid alternative. The concept itself is adorable—simply put, Nyanpire is a kitten that has become a cuddly blood-sucker after a vampire gave the hungry critter a transfusion. 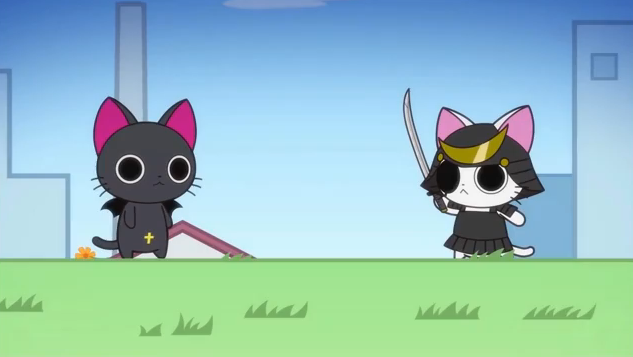 As the show develops, we eventually meet other cat-based derivatives of samurai, angels, ninja, and the like, all meeting Nyanpire in amusing ways. By itself, the animation is meant to be short and succinct, here and gone in the span of three minutes, but the brutal decision to cap the end of the show with a ninety-second ending sequence that has little to do with the animated show kills it. In fact, the ending can barely be called "animation", as it's merely a live-action sing-along song from Hyadain that is meant to occupy kids for a tad longer. It's perhaps unfair to judge Nyanpire the Animation as a full show, but if you're going to advertise it as one, it needs more of a kick than this weak effort. Admittedly, there seemed to be something intriguing about Morita-san wa Mukuchi on the surface. 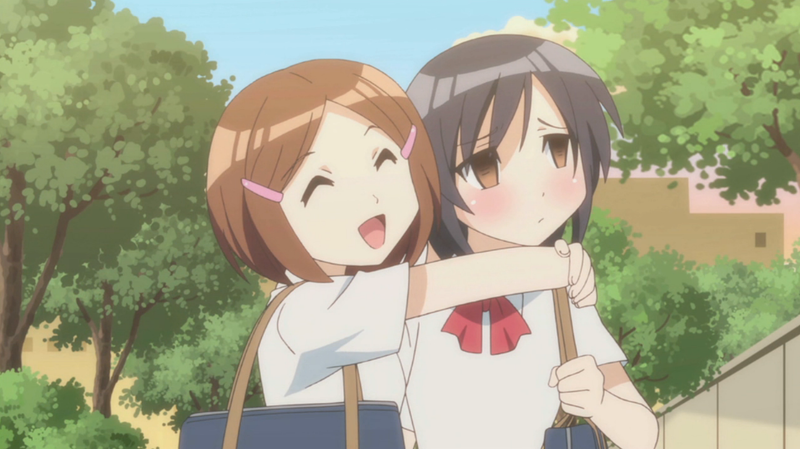 The original manga from Tae Sano was a yonkoma, so it was pretty obvious that the show's direction would be similar to an Azumanga Daioh, while the animation by Studio Seven would be closer to a K-On! or a Hyakko. It was a disappointment to learn that it would be chopped into bits no bigger than a CD single in duration, but at least there was still promise, right? That being said, there's really not that much under the skin of this fruit. Neither good nor bad, Morita-san wa Mukuchi figures it would be best to provide slice-of-life profiles for each character. However, instead of providing characters with absurd quirks or annoying tics, Sano produces characters that are no different than those you see every day in school. 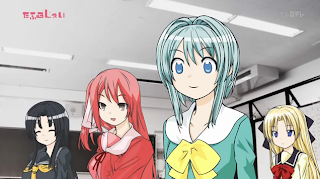 There's a chatterbox, a fashionista, and a terribly shy worrywart, leaving Mayu Morita to be the only real unique person in the group. As the title suggests, Mayu is the hazy-eyed mute in the group, keeping a cheerful nature and a solid circle of friends despite never once speaking to them. With that in mind, you would think that there would be no need for a voice actress. So...why exactly is Kana Hanazawa providing her voice for Mayu's inner thoughts? It totally defeats the purpose of having a mute character. In fact, this isn't the first time Hanazawa has voiced for a character that shouldn't have a voice—Mayu is merely a less shy version of Sora from Sketchbook. With that all in mind, why even animate Morita-san wa Mukuchi at all? It just feels like a sliver taken off of some other animated yonkoma. The humor is bland for the first three "episodes", and the characters are hardly unique enough to demand attention. At this point, it's hard to believe that the story or animation could get any better, and adding a bizarre twist at the point would just make matters worse. This isn't the worst 210 seconds of your life, but you could be doing so much more with it.